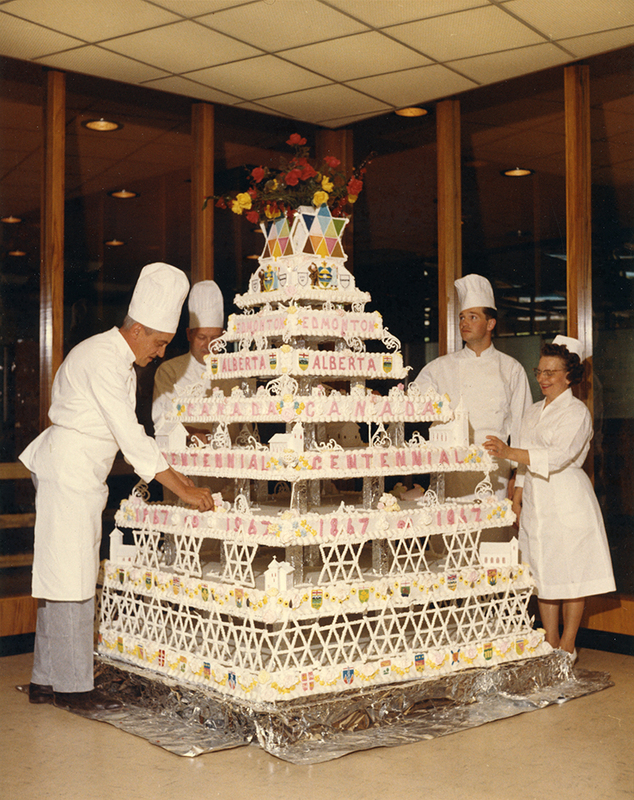 Spurred on by available grants and the Centennial spirit, Edmontonians threw themselves into celebrating 1967 through a huge number of projects. If you were in Edmonton in 1967 you’ll likely remember some of these, and you may even recall some we haven’t mentioned. Provided with enough space and time, a thorough exploration of local Centennial projects would be a fascinating project. However, in this exhibit we can only hope to touch the surface of what the community pulled together. Peter Aykroyd, author of The Anniversary Compulsion and director of public relations for Canada’s Centennial Commission, has said you can tell a lot by a place based on the projects that were undertaken in the community. What do these projects tell you about Edmonton in 1967? Not all Centennial projects were completed as expected. For example, the Edmonton Chamber of Commerce planned to preserve the clock tower of the old Post Office at 100 Street and 101A Avenue by dismantling the tower and rebuilding it in nearby Winston Churchill Park as part of the new Civic Centre plan. In 1972, after several years of negotiations, the Post Office was demolished. The clock now sits near the entrance to the Westin Hotel, though the tower was not reconstructed. However, other pieces of the tower were eventually used in a memorial located at Evergreen Memorial Gardens. 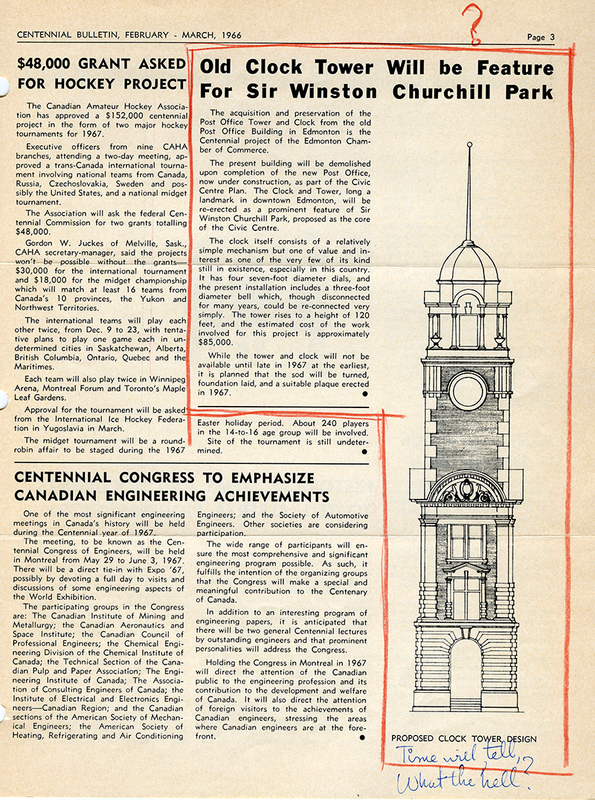 This article from the March 1966 issue of the Centennial Bulletin describes the Edmonton Chamber of Commerce’s project. As can be seen in the annotation at the bottom, not everyone was confident the project would be completed. 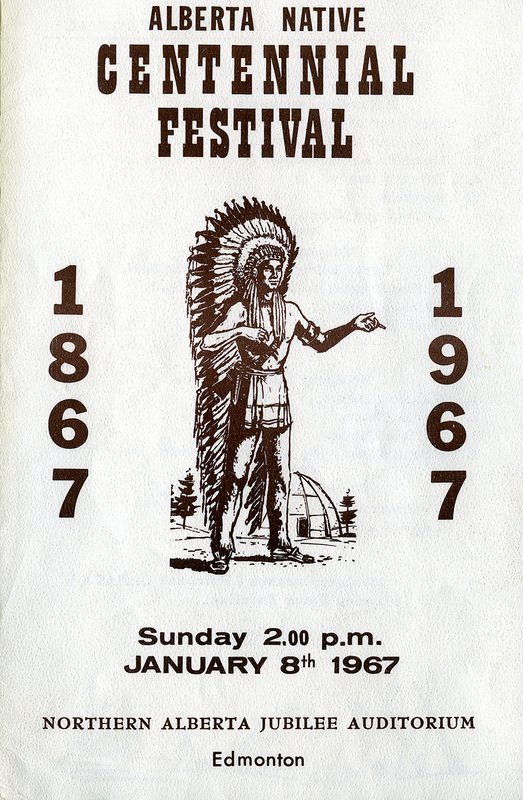 The Alberta Native Centennial Festival was one of the first Centennial events held in Edmonton. Supported by the Federal and Provincial governments, this festival was organized by Tom Cardinal, Eugene Steinhauer, James Elk, P.J. Bellrose, Robert Grey, Chester Cunningham, Wilfred McDougall, Shirley Cardinal, and Bernie Oppelt. It included dancers from various communities across Alberta, and a special performance by one-time Edmontonian Marlene Jackson, reigning Indian Princess of Canada. First formed in January, 1965 as a Centennial Project for the Edmonton Public School Board, by 1967 the Edmonton Centennial Singers were a group of 84 students from various high schools in Edmonton. The choir performed at local Centennial events and represented Edmonton through concerts across Canada, including Expo 67 in Montreal. A dutch organ was donated to the Storyland Valley Zoo by the Dutch Community in Edmonton. 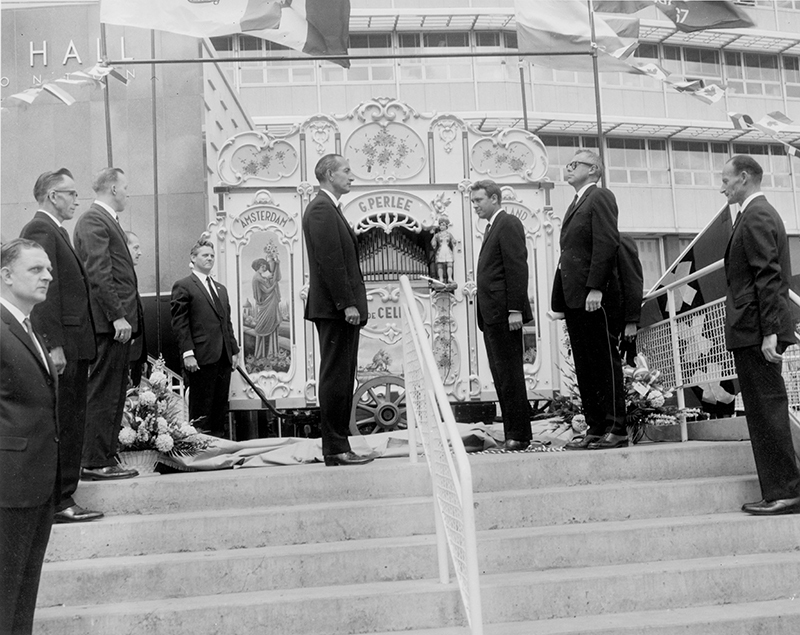 The organ was unveiled on July 1, 1967 at City Hall, where it played the national anthem and Bobby Gimby’s Centennial anthem “CA-NA-DA”. This calendar was created by the Alberta Society of Artists and the Alberta Federation of Home and School Associations. 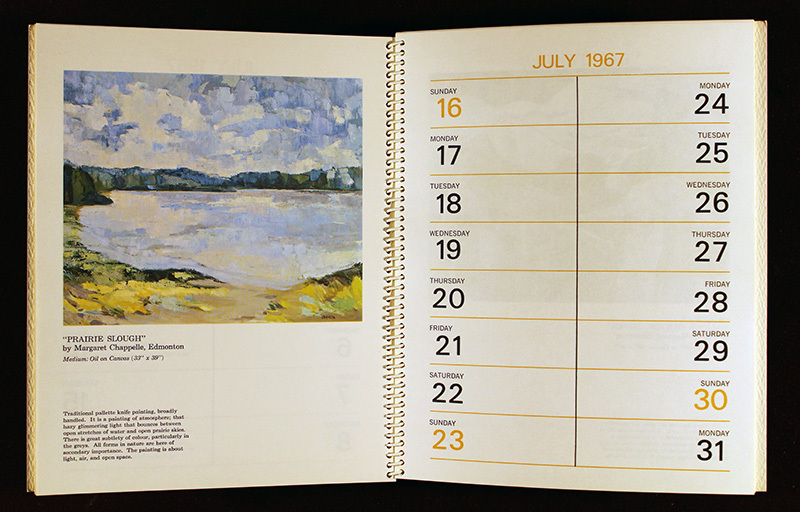 It was illustrated with reproductions of paintings by Alberta artists, and was meant to be used as a personal diary to record 1967 and thereby become a meaningful souvenir. Many books were written as Centennial projects, including Edmonton: A History by J. G. MacGregor, paid for in part through a municipal Centennial grant, and published by Mel Hurtig. Other publications included Schools of the Foothills Province by Edmontonian John Chalmers on behalf of the Alberta Teachers’ Association, the Atlas of Alberta by the University of Alberta, and Alberta: A Natural History, made possible by the contributions of academics and the private and not for profit sectors. As well as projects done by government and large organizations, there were a myriad of large and small projects done by individuals as a way to celebrate the Centennial year. 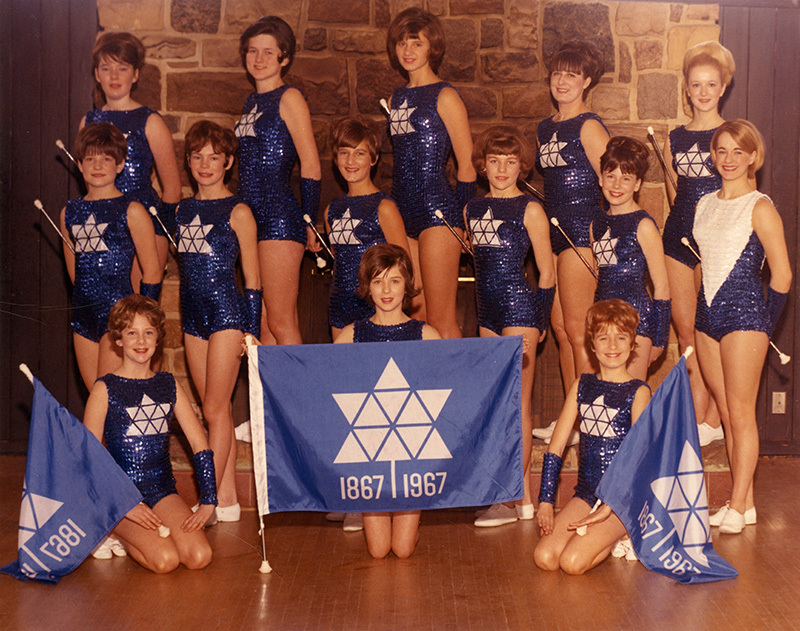 The Klondike Centennial Majorettes, for example, began as the personal project of Arlene Weber. This group of 14 girls, aged 12 to 18 performed at numerous events, and were said to specialize in Centennial routines. By collecting donations at their performances, they raised enough money to travel to Montreal to represent Edmonton at Expo 67.